Looking for more? Read more posts about Goal-Setting & Say Goodbye to Survival Mode. Thanks for all the posts about goal setting. The past year I felt like I was spinning my wheels. This year I have goals, not resolutions for the coming year. Part of my learning curve is that I don’t have to do it perfectly or an exact way. For instance, I wanted to have a cute notebook to write in and record my progress in it each day. So far I haven’t made it to the store to find this elusive notebook, so I just have to do with what I have. Also, January 1 isn’t some magical date, if things don’t happen exactly on that date, then start the next day. Especially since it looks like I will be starting the New Year with a cold. I love cute notebooks, but I find cute pens more motivating. Especially fun colors that reflect my mood that day – dark green, hot pink, purple, orange…. On the flip side, my two favorite notebooks: 1 is an owl one from Ikea. The other is a plain black one, that I added sticker letters (already had at home) to that are cute. It’s now a cute notebook that I like. Can’t wait to find out what the BIG thing is in April. I wonder if they are expecting a new little one?!? Probably not though, if she’s doing P90X. Hmmmmm?!?! Thank you for the timely reminder to set SMART goals. I have mine written down and will be blogging about them later today! Love it! Thanks for sharing! I have not even had a chance to sit down and write out my goals for 2014 , although I’ve been thinking them out in my head. With 4 very young children, including a newborn, I can only fit so many extras into the day. One thing’s for sure – if I can’t even find a slot of time to write down goals, I certainly don’t need to be setting big ones. 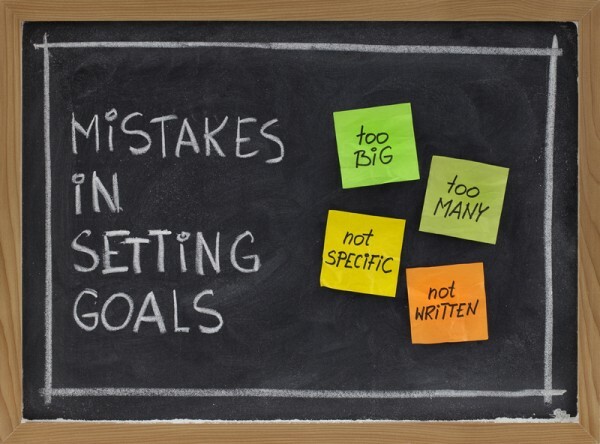 Hmm…how can I make sure goals like “feed the kids and change their diapers” are measurable? I guess I’ll just try to make sure I do it for 21 days straight! 🙂 Seriously, I really do appreciate reading your lessons learned; they will definitely be a help as I think through what goals I can realistically reach and how I when I can reach them. Thanks for sharing this. I just went back and re-evaluate the goals that I was working on for 2014 and your advice helped me to re-write a few goals that weren’t specific or measurable enough. I love the simplicity of your new goals. Best wishes for your new year! I’m so grateful! It’s amazing what a difference simplifying goals has made for me already going into this year! I love this, probably because I’m changing my goal setting approach in 2014 too–although in different ways than you listed above. After having huge success with a handful of goals, I did some serious evaluating of why they worked so well, and I’m applying that to all the goals I’m setting for 2014. For what it’s worth, I had no idea you were experiencing growing pains! Double the growth, holy smokes! But things seemed smooth to me, as a reader. I love the idea of applying what worked to your future goals! I love this post! I turned 35 in 2013 and made a list of 35 things that I wanted to achieve/experience. I didn’t cross off all of the things on my list. I am okay with that because my life went in a unexpected direction. After lots of discussion and prayer, my husband and I decided that I would go back to school to become a nurse. This has been a dream of mine since I was 17 years old!! I could have dug in my heels and determined to cross off every item on my list. I knew that would have driven me crazy so I just let it go. God led my life in a different direction and it is amazing!! My plan was good but His is GREAT!! I love this — and I’m excited for you! Thanks for taking time to share! Happy New Year Crystal! I love this article…very practical and applicable. I havent commented in awhile, life got really busy for a bit, but Ive still been reading along and gleaning wisdom from you and your guest posters! My husband and I had a good conversation about your “When you disappoint yourself post”…putting a lot from there into action. Looking forward to learning more from you this year here and from your book. Wishing you and your family the best in this new year! I was just thinking this past week about you and wondering how you were doing. Glad to hear things are well for you. And thank you for your encouragement, as always! I have not been great at goal setting and really attempted this past year. 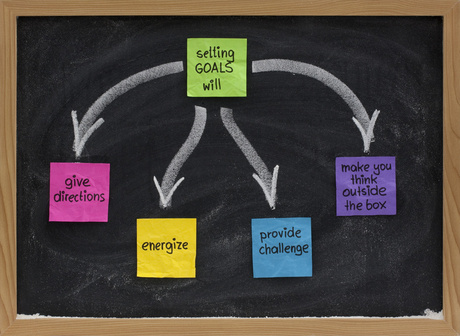 When I look at the goals I realize my problem was not having the steps written down on how to accomplish those goals. I will definitely be doing things different this year. But my biggest take away from 2013 was the one goal that was a huge feat for me I came close to accomplishing! Through your encouragement I got back into reading. And in 2012 I read 12 books! So I doubled that goal to 24 for 2013. And I read 23!!! For me this is huge because I really struggle to find time for me or balance in my every day life. But I was persistent in finding 20minutes here and there. Thank you for being a continued source of encouragement. Can’t wait to hear your BIG news!!! That’s FANTASTIC!!! Way to go! Care to share how many people it takes to run your site? Thank you for sharing! I think I have set up too many goals for this year (especially considering coming of our first baby this February! Exciting and scary!) but I am not going to remove any of them from the list. I was just listening to one of the podcasts interview with Michael Hyatt, and he said something like this “it’s better to set goals and achieve fewer than you have set. If you don’t set any, you definitely will not achieve any”. So I choose to set a lot and be happy with what I achieve. A good reminder from you is to make them measurable…it’s hard though sometimes especially when you are just starting something and have know idea how things will be working out. We all have to give ourselves grace – no matter what we’re dealing with! And yet, maybe the interruptions are the most important thing at this stage of my life. Filling my home with grace and being willing to set the list aside and just be. Especially being willing to unplug and model LIFE to these boys, instead of watching others live life online. I have so many thoughts for this year. I will set some concrete goals, but they will be hard to measure at the end of the year…and yet to have teenagers who I love to hang out with…this is a gift. Happy New Year, Crystal. Thank you for all of the encouragement on the journey! Such good words of advice. Thanks for sharing! I love how you “keep it real” for us. It’s nice to know I am not alone in setting over-ambitious goals, and as a fellow blogger, it’s humbling to me to realize it’s okay to tell your readers. Can’t wait to hear about your surprise! By the way, have you posted your 2014 goals yet?